Before beginning to write your essay it is important that you brainstorm all the ideas that you will describe in your essay. There are many ways in which you can brainstorm or gather your ideas – mind maps, taking notes etc. The most important point is that you know what you want to share with the reader. 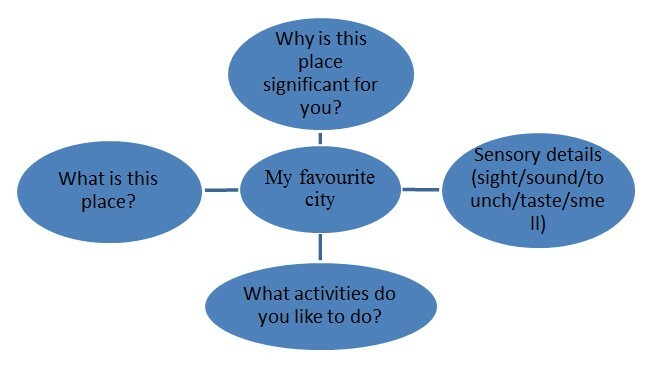 Below is an example of how to brainstorm ideas using a mind map. Below is an example of how to brainstorm ideas using a table. Sensory details How you feel when you eat? (before and after) How you came across this meal? Details of place? There are several organisational patterns you can follow to write a descriptive essay. You may choose to organise what you are planning to describe by time, location or another order of importance. Refer to the table below for a general guideline of what you should include in your essay. Chronological – organising the details of your essay in their order of occurrence in time. This organisation strategy is mostly used when describing an event or a series of events. Spatial – organising details of your essay according to ‘space’. In other words, if you are describing your car you will organise it into front/back, inside/outside etc. This organisation strategy is mostly used when describing an object item or place. You should avoid using vague words (such as good, nice, wonderful). Instead you should be specific and use sensory descriptive words. Refer to the list below of sensory descriptive words. Abstract terms refer to ideas or concepts that are intangible and not available to the senses meaning they are not things that you can see, hear, smell, taste or touch. Take ‘love’ as an example – we cannot see it, hear it, smell it, taste it or touch it. Love is therefore intangible. It is a concept or feeling only. Concrete terms refer to ideas, objects or things that are available to the senses. Concrete terms are things that you can see, smell, touch, feel or hear. When writing descriptive essays it is important for you to use concrete language rather than abstract language to communicate your ideas. This is because by using concrete language you are essentially giving the reader information that is easily understandable and relatable. In doing so what you are describing will become clearer to the reader. Therefore, be sure to avoid using abstract language as it will make it more difficult for the readers to connect and understand your writing. The main purpose of a descriptive essay is to provide readers enough details to allow them to visualise or connect with what you are writing. Similes and metaphors are very often incorporated into descriptive writing because they can help to communicate specific messages or ideas more effectively. Simile – A figure of speech involving the comparison between two things that are generally not alike by using the words ‘like’ or ‘as’. -	Her baby cute as a kitten. -	Life is like a box of chocolates, you never know what you’re going to get. -	His room is as smelly as my feet. -	You were as brave as a lion. Metaphor – A figure of speech in which a word or phrase is applied to an object or to an action which is not literally applicable. A metaphor creates an image of feeling by making an interesting comparison between two things that at first appear unrelated. -	My heart swelled with a sea of tears. -	The snow is a white blanket. -	Life is a roller coaster. -	She is a peacock. -	The boy’s room is a disaster area. -	Thomas is a shark. Does the word choice or the language you have used help the reader understand your topic? Indicate whether the given words are abstract terms. Complete the simile by dragging the most suitable word. Select the most appropriate meaning of each metaphor. Life is like a rollercoaster. She was trapped at home. Her house was at a secluded location. He is very active at night. He likes act like an owl. My brother looks like a potato. My brother is some who does little exercise and sits in front of the TV. My brother each potato ships on the couch all the time. Tom’s heart is a rock. Tim is a heart breaker. Tim is a steady and reliable person. Tim is a very rough person. He was feeling very sad. His best friend is a sheep. His best friend is very noisy. He best friend is a follower. His best friend is a vegetarian. Their relationship had turned sour. Their relationship was sour tasting. You are my partner for life. You brighten up my life. You make me feel many emotions. He is a rich person. He is a very kind person. He is a very abled person.